Acrylic Sign Holders are some of the most widely used products in modern visual merchandising and store design. Acrylic is useful in nearly every retail application due to its affordability and versatility. Acrylic can be used in conjunction with Grooved Slat Panels and can be found as a crucial element in many custom fixtures. 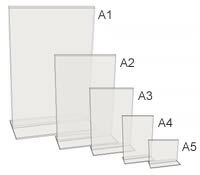 Listed below is only a small range of available acrylic sign holders. Please feel free to contact a MSP Shopfittings Representative if you can not find the product you require.